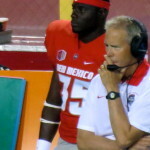 Bob Davie’s New Mexico team comes into this season hoping for a breakthrough. 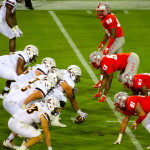 With the game being on a rare Friday night, one might assume that the typically electric atmosphere in Sun Devil Stadium might be lacking, thus creating prime real estate for a Lobo upset. 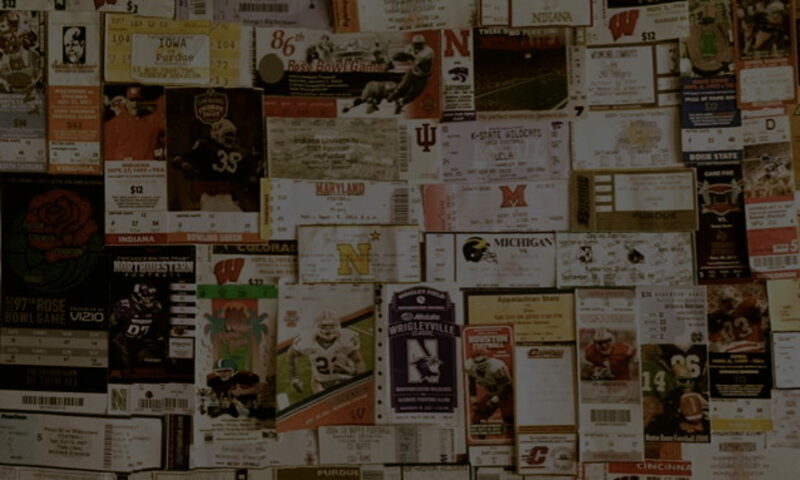 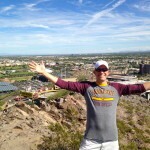 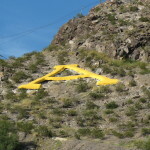 Well, it may have taken a bit longer for the enthusiasm to reach its summit, but Tempe was pulsating as kickoff loomed. 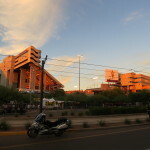 Surrounding bars and eateries were crawling with fans, and as the sun set behind “A” Mountain, this historic stadium was primed to intimidate. 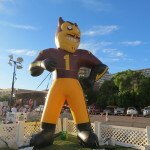 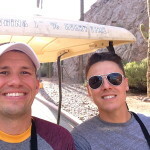 You can experience it from the Devil Walk, where ASU fans, Sparky, and the Sun Devil Marching Band welcome the team as they head over for the game. 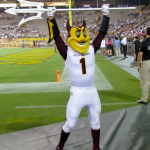 You can hear it as an Arizona State drumline pounds out beats around the stadium. 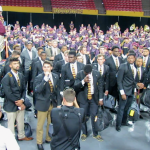 You can see it as a flood of maroon and gold motions its way toward the turnstiles. 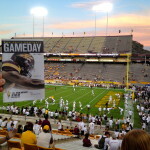 Gameday here is special, and the team wasn’t about to disappoint tonight. 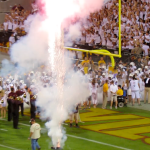 Fireworks welcomed the team as they charged the field to a rousing welcome. 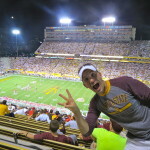 But, the pyrotechnics team wouldn’t be very busy celebrating Sun Devil scoring drives until the second half. 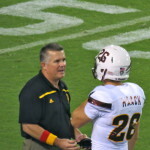 However, not much doubt lingered. 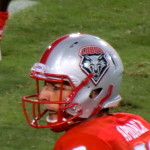 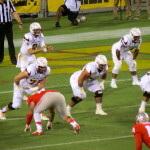 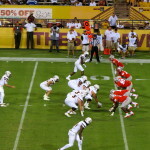 Despite a big play touchdown by New Mexico in the third quarter, Arizona State took command of the game in the second half led by quarterback Mike Bercovici who ran for one score and threw for three – one being a 93-yard door slammer that sealed the game. 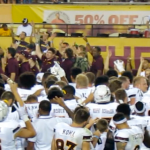 It was one of those games where suspense rode the bench – there was never much doubt that the Sun Devils would win. 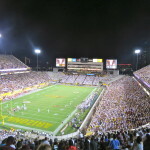 Fans filed out feeling a bit more confident in their team, but USC comes visiting next – suspense may be playing a pivotal role. 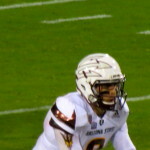 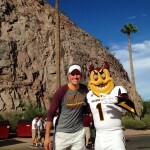 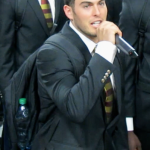 QB Mike Bercovici addresses the fans.